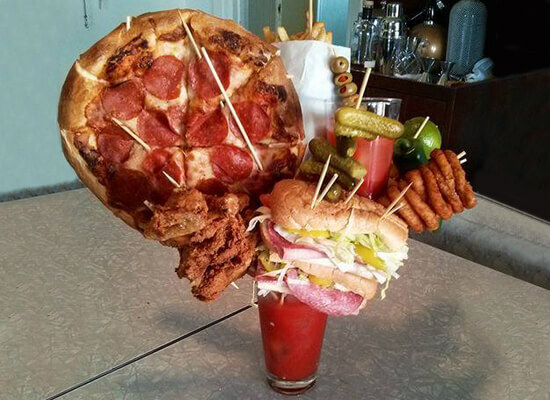 This Bloody Mary is served in a 22 ounce glass with a salted rim. It’s made from house infused bacon vodka using Absolut Vodka and Taste Of Florida mild or hot Bloody Mary Mix. Here’s where it starts to get a little crazy. 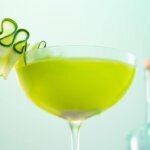 The garnishes include pickled asparagus, green beans, green olives, pepperoncini, lime, lemon, homemade candied bacon, shrimp with cocktail sauce, a slider, a skewer with an olive, cheese cube, jalapeño slice, baby tomato, cucumber slice and summer sausage medallion. 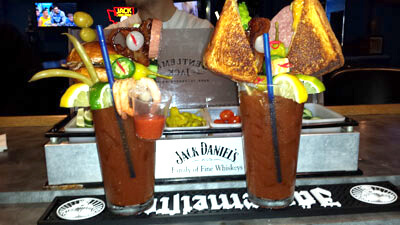 This variation of the Bloody Mary consists of thirteen garnishes. 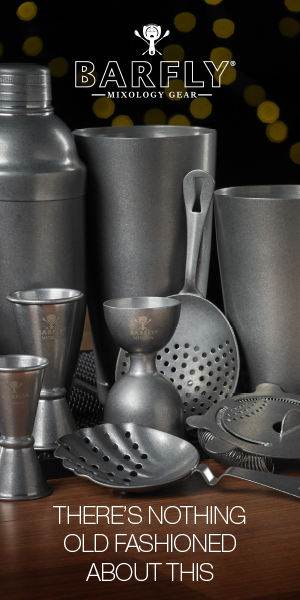 You read that right, thirteen different additions to a basic Bloody Mary. They include the usual celery along with brussel sprouts, onion, tomato, mushroom, lemon, pickle, sausage, shrimp, cheese, olive, asparagus and a bacon cheeseburger. The base is locally produced Rehirst Vodka and Jimmy Luv’s Bloody Mary Mix. 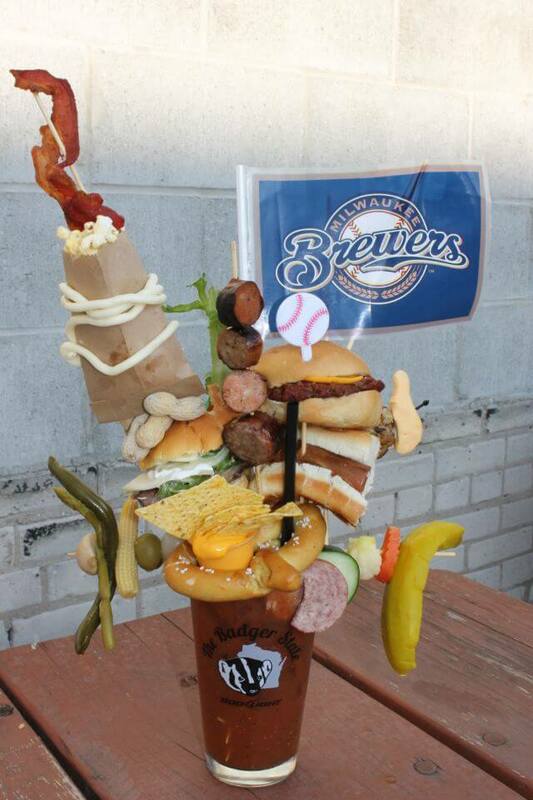 We are carrying on the tradition of insane Bloody Mary’s in wisconsion by adding the offering from O’Davey’s. 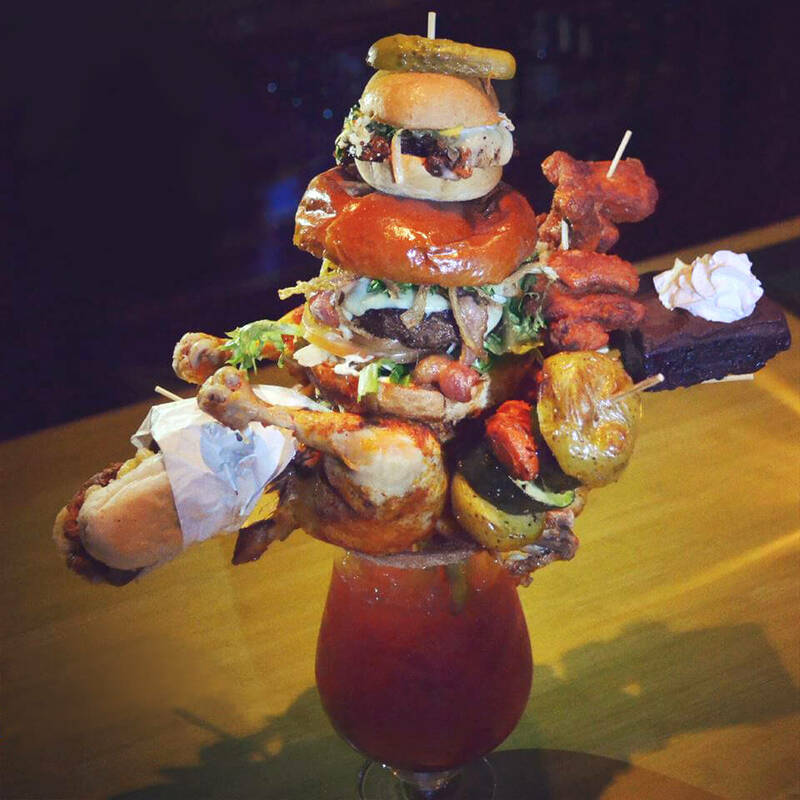 The seemingly limitless garnishes include bacon, peanuts, beans, popcorn, sausage, a pretzel, burger sliders, a pickle, cheese, various vegetables and nachos. It wouldn’t be Wisconsin if they didn’t throw some cheese curds on there as well. Apparently, the drink is only $5. That’s quite a deal for a week’s worth of food. 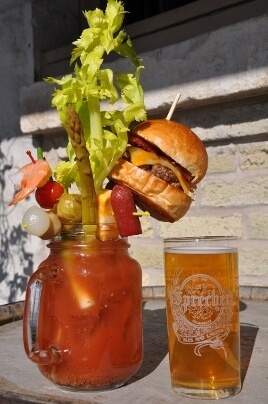 Apparently, in Canada, Bloody Mary’s are called Caesar’s and this one is just bonkers. For only $60 Canadian, customers are treated to garnishes that include a completely intact roast chicken, a whole cheeseburger, a slider, multiple chicken wings, onion rings, pulled pork, macaroni and cheese, a hot dog and for desert, a brownie. 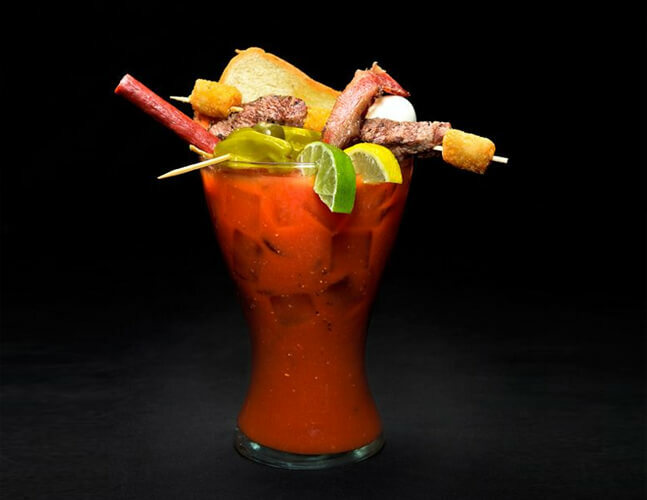 Served in a 32 ounce glass, the Nook’s Best Bloody Mary is truly a southern delicacy. 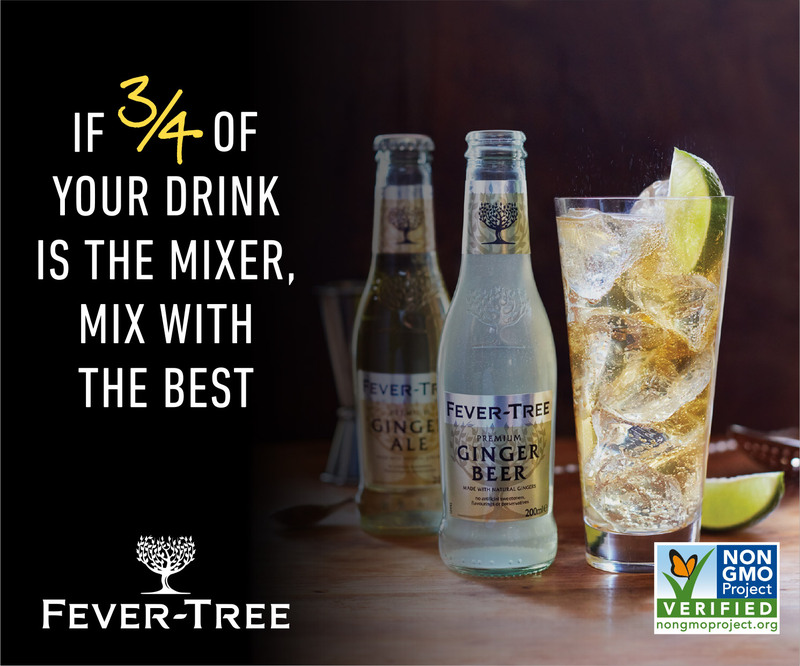 The drink is made using Absolut Peppar mixed with their housemade bloody mary mix. Garnishes include jalapeños, tater tots, pepperoncini, toast, lemon, lime, a hard boiled egg and slices of steak. For those who are even more adventurous, a Slim Jim straw is available to get the best overall experience.